All families take note! – This freshly renovated and extended home now offers a level of elegant refinement you rarely find in this price bracket. All the work is done. You just have to move in and decide who will have which bedroom! Set on 1,163sqm of beautifully landscaped gardens, this spectacular award-winning residence showcases sublime harmony, finesse, perfect scale, and is poised to deliver an extraordinary lifestyle to you and your family. 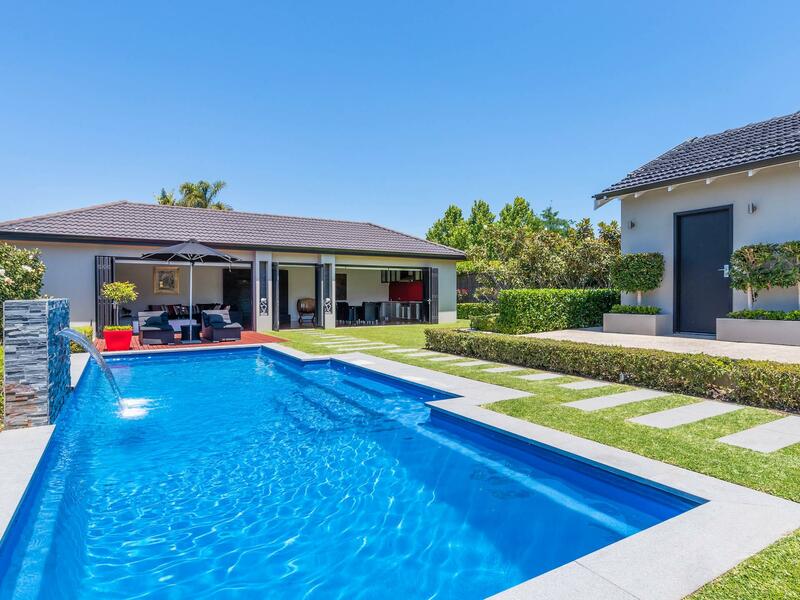 Offering 6 bedrooms with master on the ground floor, 5 bathrooms, study, open plan family and dining off kitchen, stunning pool, phenomenal poolside pavilion, gardens, and lawn, on a spacious 1163sqm of land with ROW, it is a standout offering on the river end of Philip Road. The street frontage is immaculate and understated; with landscaped gardens bordered by manicured hedging and beautiful rose bushes. Inside, a versatile and intuitive floorplan is designed for flexible functionality and excellent separation of space. Abundant natural light cascades into classically elegant, generously proportioned interiors, emphasizing the seamless connection to outdoor entertaining spaces. The glorious master bedroom and open plan luxury en-suite is an oasis of tranquility with vast windows soaking up magnificent garden and pool views. Next door, there’s a huge fully fitted dressing room, and beyond, a luxe bathroom, separate WC and light filled bedroom currently used as an activity room for younger members of the family. Beautifully balanced interconnected family living, dining and kitchen exude comfortable warmth and easy sophistication. A triumph of luxury and convenience, the superbly appointed kitchen is an inspiration to talented home chefs with banks of timber cabinetry topped with pale Corian, Miele appliances, a Corian waterfall island with casual seating, and floor to ceiling pantry. Family living and dining areas open to a shaded casual dining terrace. Beyond the glass fence are spectacular landscaped private grounds with a gorgeous dove grey and white cubbyhouse, extensive paved terraces, manicured lawns bordered by formal hedging, beautiful magnolia trees, a sundeck and sumptuous heated pool. At the rear, the magnificent Bali inspired pavilion complete with serene water wall is ideal for hosting both intimate gatherings and grand scale entertaining providing large living and dining spaces plus a luxury integrated BBQ kitchen with every conceivable amenity. The current owners have hosted a wedding with over 120 guests without requiring use of the main home. The award winning upper level accommodation is abundant and luxe. Three huge bedrooms with picture windows overlooking the leafy tranquil street, wall to wall built in robes and desk space, a beautifully elegant bathroom and powder room. A shared living room and study nook for the kids offers great separation of space. Overlooking magnificent rear gardens and a stunning pool is an elegant guest bedroom with BIR and luxury en-suite. An idyllic sanctuary, this magnificent family home offers a perfect blend of contemporary sophistication, modern functionality and extraordinary style. Good times and great memories await. Exclusively situated in prestigious riverside locale, with excellent schools, parks and local shops nearby. STUNNING DALKEITH HOME WITH BESPOKE EUROPEAN STYLE.